At the U.N. as in Latin America, Beijing’s money outweighs morality. 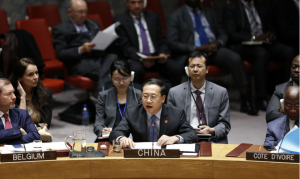 China used its United Nations Security Council veto in February to knock down a resolution condemning the fraudulent May 2018 Venezuelan presidential election and calling for new elections and international humanitarian aid for the country. The resolution was backed by France, the U.K. and the U.S., but the veto was especially painful for the Venezuelan people and their South American neighbors. Russia also voted to block the resolution, but it might not have done so without China’s cover. Vladimir Putin is wary of being isolated from the international community. The China-Russia veto gave dictator Nicolás Maduro and his Cuban handlers assurance that the U.N. would not intervene in Venezuela. Since then the country’s downward spiral has accelerated. Some 50 democracies have recognized interim President Juan Guaidó as Venezuela’s legitimate leader, but he has been unable to begin his work to restore order. Power outages have exacerbated shortages of food, water, gasoline and medicine. Malnutrition has been rampant for years. Now hospital patients are dying and the danger of mass starvation is real. There is a growing cry from Venezuelans for U.S. military intervention. Americans are accused of turning their backs on humanity because Washington is reluctant to start a shooting war to topple Mr. Maduro. "Capitalism as we know it is over."